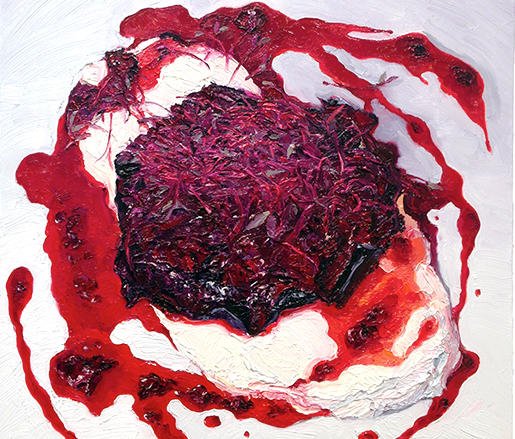 With oil paint, Mike Geno aims to translate and recreate the seductiveness of food through texture, color, and form, focusing his work on the specific beauty of each dish. The works act as homage to another artisan, the chef, and are the result of a shared passion. This show will feature composed dishes from a collection of Philadelphia chefs. Located in the reception space where guests mingle and meet before meals, the Greenhouse Gallery exhibits the works of up-and-coming and established artists who work with culinary themes. Providing artists with a complimentary space to show their work not only enhances the overall ambience of the room during events, it’s also in keeping with the Foundation’s mission to celebrate, preserve, and nurture America’s culinary heritage and diversity. Past exhibits have featured mouthwatering food photography, romantic watercolors of mealtime still lifes, and exuberant mixed-media collages.